We live in a fast paced world where everyone claims to be “busy” and making your own coffee is one of life's underrated delights. Global instant beverages premix market is significantly rising across the globe on the back of rising number of market players and rapid pace urbanization. Beverages help in complete nutritional well-being and prevent various health conditions. With the increasing number of working people, busy lifestyles and increase in disposal income, the demand for instant beverage premixes is increasing. Few major benefits of instant beverage premixes are, they enhance brain functionality, boosts metabolism, and provides healthy hydration. Goldstein Research analyst forecast the global instant beverages premix market size is set to reach USD 68.90 billion by 2024, at a CAGR of 5.20% over the forecast period. 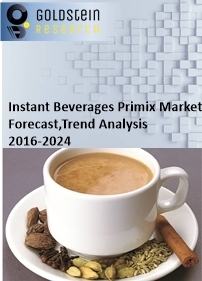 The report covers the present ground scenario and the future growth prospects of the Global Instant Beverages Premix Market for 2016-2024. We calculated the market size and revenue share on the basis of revenue generated from major players across the globe. On the basis of product type, instant coffee premix held the largest share i.e. 32% of the total instant beverages premix market in 2016 due to its tempting taste and aromatizing aroma. Instant tea premix market acquires the second largest market after instant coffee premix market and is estimated to reach the valuation of USD 15.1 billion by 2024. Instant health drink premix tends to dominate the market, registering a CAGR of 5.22% over the forecast year as people are becoming more health conscious and premixes are capable of reducing tea preparation time. Coffee machine market outlook 2016-2024, has been prepared based on an in-depth market analysis from industry experts. The report covers the competitive landscape and current position of major players in the global coffee machine market. The report also includes porter’s five force model, SWOT analysis, company profiling, business strategies of market players and their business models. Global instant beverages premix market report also recognizes value chain analysis to understand the cost differentiation to provide competitive advantage to the existing and new entry players. Other high-flying vendors in the market are: The Coca-Cola Co., Monster Beverage Co., Keurig Green Mountain Inc., Dunkin’ Brands Group Inc., Starbucks Corp., PepsiCo Inc., and Ajinomoto General Foods Inc. According to the report, rising number of players and entry in instant beverage premix market is one of the major aspects which are increasing the product supply into the market. With the increased supply, price competitiveness will increase which leads to decrease the price of the instant beverages premix. This factor is expected to trigger the demand for instant beverages premix. On the other hand, rising trend of online grocery stores are opening new opportunistic doors for the market players to distribute their products through online portals. The online grocery market reached USD 48.2 Billion in 2016 and further this market is anticipated to reach USD 138.6 Billion by the end of 2024. On the back of these factors, instant beverages premix market is expected to make its own way in the food and beverages industry across the globe. Further, large availability of low price products in developing countries such as China, India, Malaysia, Italy, Spain, Canada and Others are increasing the competition into the market and also hampering the trust of new customers which are unaware about the instant beverages premixes. Major players are developing the strategies in developed countries to capture the potential markets to generate high revenue from the developed countries such as U.S., Germany, Japan, The United Kingdom and others. However, the major challenge is the lack of awareness among the population toward instant beverages premix and low availability of quality product in the market. Based on geography, Asia-Pacific held the largest share i.e. 51.4% in the global instant beverages premix market in 2016 due to growing youth population. Countries like Japan, China, India, Australia and Singapore hold the maximum share in the forecast period due to increasing health awareness and rising personal disposal income. Whereas, North-America is expected to grow by 28.0% in the global instant beverages premix market by 2024. What is the revenue of global instant beverages premix market in 2015-16 and what would be the expected demand over the forecast period? 8.2.1.1. Neel Beverages Pvt Ltd.
8.2.6. The Republic of Tea Inc.
8.2.9. Keurig Green Mountain Inc.
8.2.10. Dunkin’ Brands Group Inc.
8.2.13. Ajinomoto General Foods Inc.